Cider mills are common in Herefordshire, a major apple growing area. These antique cider mills mostly date from late Victorian or early 20th Century and were hand carved from local sandstone. 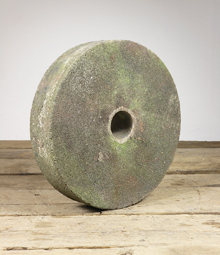 A horse or donkey was used to pull a large stone wheel, pivoting round a central point, which crushed the apples contained in a large groove. The crushed apples were then put in a cider press, which was a wooden structure with a stone or occassionally wooden base and screw operated press. 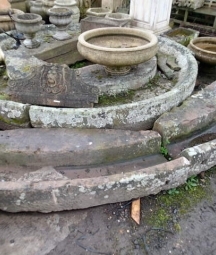 We also sell old grindwheels from corn mills, which are always popular and can be made into water features, tables and used for other decorative purposes. 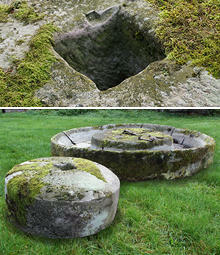 These millstones are often made from granite or gritstone.